At the beginning of the "Beijing Spring", thousands of "dazibaos" appeared in various Chinese cities, dealing with current political issues as well as personal grievances of the so-called "petitioners". A first culmination was reached in November and December 1978 when high-ranking officials were often attacked in person, especially those who were suspected of blocking political and economic reforms, and many authors also dared then to directly criticize Mao and his policies. After mid-January 1979, when the first activists had got arrested, many authors became more cautious. And when Deng Xiaoping had announced the "Four Basic principles" at the end of March, direct attacks on party leaders and party policies virtually stopped. But the posters still continued to voice personal discontent and to demand rehabilitation and compensation for sustained injustice. 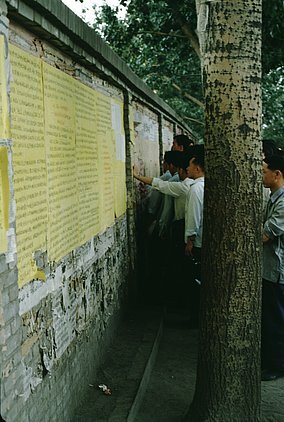 The photos shown here are just examples for the variety of themes and debates taken up by dazibaos during that period.